"Your Jaws ~ Your Life"
To Show and Advance the Unique Health Benefits of Functional Jaw Orthopedics The Newest Form of Orthodontics and Real Alternative Medicine. 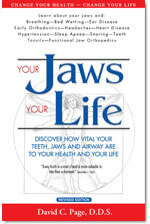 SmilePage® Publishing holds exclusive rights to international sales of the new (2003) first ever book on alternative medical dentistry: Your Jaws ~ Your Life. Thousands of copies of this groundbreaking alternative health book have already been sold to readers in over 15 countries World-Wide. published articles from professional journals and research materials. REMEMBER TO VISIT SMILEPAGE OFTEN! This web site--www.SmilePage.com, will continuously be updated to relay health related information, breakthroughs and ongoing research. 10 Steps to Better Health | Save Your Teeth - Change Your Life | SmilePage News Archive | Smile Tips & Health Tips | F.A.Q.